On Spark Of Life, recorded in Lugano in March 2014, and produced by Manfred Eicher, the Wasilewski group balances original material – intensely melodic new tunes by Marcin (including variations of the beautiful title track), and one from Milder (the buoyant “Still”) – with an eclectic range of covers. The players embrace Herbie Hancock’s “Actual Proof” (an acoustic version of a tune very much associated with the sonorities of the Fender Rhodes), the Police’s pop hit “Message In A Bottle” (here given a robust, Tyner-ish rhythmic emphasis), “Do rycerzy, do szlachty, do mieszczan” from Polish grunge-rock group Hey, and Slawomir Kurkiewicz’s sensitive arrangement of a piece by contemporary classical composer Grazyna Bacewicz. Throughout, the Wasilewski Trio reinforces its status as one of the most resourceful groups around. This is the trio’s second ECM appearance in a matter of months, following on from sterling work as Jacob Young’s rhythm section on Forever Young. The rapport between band members Wasilewski, Kurkiewicz and Miskiewicz is the key to the group’s singular longevity. Here are three musicians, all still in their thirties, with more than 20 years of shared playing experience. 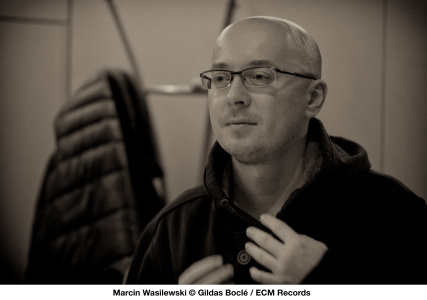 Marcin and Slawomir began playing jazz together as 15-year old students at the Koszalin High School of Music. Their first trio was formed the following year. In 1993 drummer Michal Miskiewicz, son of noted Polish alto sax player Henryk Miskiewicz, joined them, and the group’s line-up has been stable ever since. As the Simple Acoustic Trio they won awards in their homeland and issued five albums on local labels. (Their early emphasis on Komeda awakened Tomasz Stanko’s interest in the group, and through the 1990s they collaborated with the trumpeter on projects, beginning with theatre music; by the decade’s end, they’d progressed to become his regular band. In 2001 their work together was documented, to public acclaim, on the Stanko Quartet album Soul of Things, recorded by ECM in 2001, followed by Suspended Night in 2003, and Lontano in 2005. The association continues today, albeit intermittently, with the former protégés now billed as Stanko’s Old Quartet). Their first international release by Wasilewski/Kurkiewicz/Miskiewicz, entitled just “Trio” was recorded in 2004 and released the following year, immediately winning the Quarterly Prize of the German Record Critics. In the US, too, critics were taking notice. “Their years together have resulted in an ensemble with an utterly symbiotic creative flow,” noted Don Heckman in the Los Angeles Times. Subsequent ECM recordings were January (recorded 2007) and Faithful (2010). Special guest Joakim Milder was born in Stockholm in 1965. At home in many aspects of the tradition, he always serves the needs of the work at hand, simultaneously engaged and cool-toned, resolutely musical. 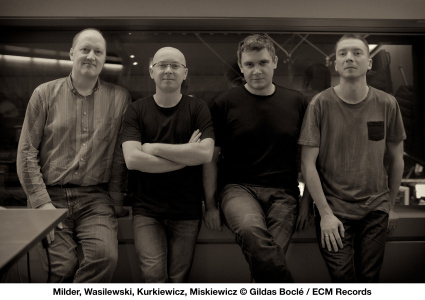 Milder joins the trio for a tour of Poland in October – details at www.ecmrecords.com. In November the core Wasilewski Trio takes the Spark Of Life programme to Argentina.